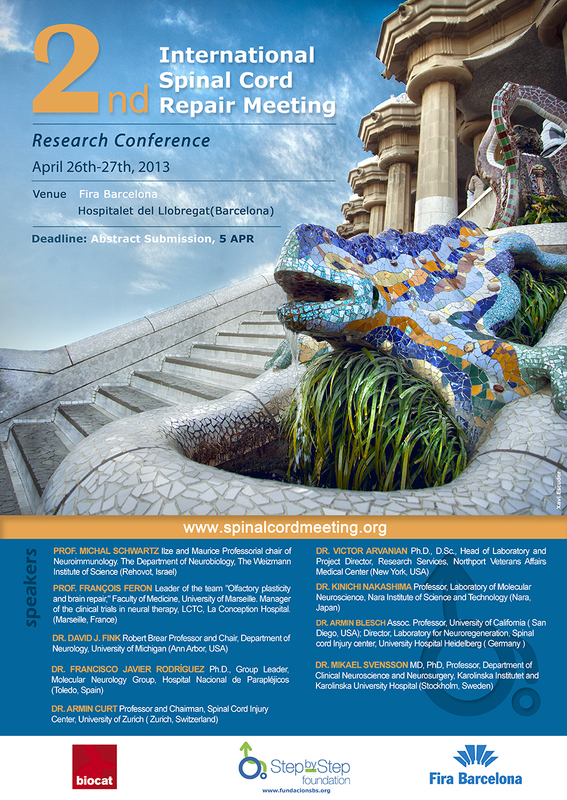 On April 26-27, 2013, the Step by Step Foundation hosted the Second International Spinal Cord Meeting at the Fira Barcelona Convention Center in Hospitalet de Llobregat, Spain, highlighting some of the exciting research including clinical trials which show promise for treatments for this devastating dis- order. This Spinal Cord Meeting brought together clinicians, clinical scientists and molecular biologists from more than 10 countries to evaluate current knowledge on clinical, cellular, and biomolecular aspects of spinal cord injury. A major goal of the conference in advancing the translation of research data to the clinic was to promote multi-pronged approaches for therapy of this complex problem.